Tuesday March 29th 1892 I finished the ironing this morning and done the other work. I went to town soon after dinner. I got me a new spring jacket and a dark calico dress. I had only just got home when it began to rain. The men were ploughting today. I read in the evening. Lee was thirty years old today. Mr Nichols came tonight. Wednesday March 30th 1892 I was busy doing extra sweeping this morning. I started to go out to Marys to help quilt in the after noon but met them coming to town. I come back and began work on my new dress. Will and I spent a very pleasant evening out there. Mr Rhiemers and Mr Peek came at noon today. 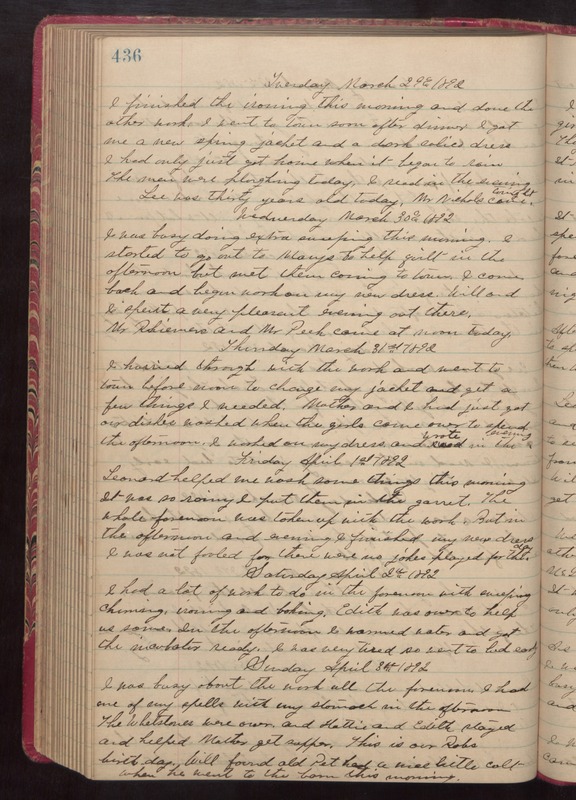 Thursday March 31st 1892 I hurried through with the work and went to town before noon to change my jacket and get a few things I needed. Mother and I had just got our dishes washed when the girls came over to spend the afternoon. I worked on my dress and wrote in the evening. Friday April 1st 1892 Leonard helped me wash some things this morning. It was so rainy I put them in the garret. The whole forenoon was taken up with the work. But in the afternoon and evening I finished my new dress. I was not fooled for there were no jokes played for the day. Saturday April 2nd 1892 I had a lot of work to do in the forenoon with sweeping, churning, ironing and baking. Edith was over to help us some. In the afternoon I warmed water and got the incubator ready. I was very tired so went to bed early. Sunday April 3rd 1892 I was busy about the work all the forenoon. I had one of my spells with my stomach in the afternoon. The Whetstones were over and Hattie and Edith stayed and helped Mother get supper. This is our Robs birth day. Will found old Pat had a nice little colt when he went to the barn this morning.